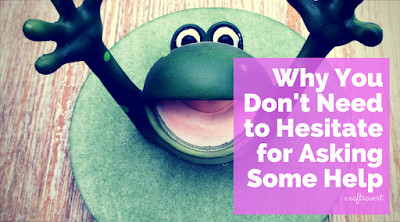 These fears usually make some people reluctant to ask for help. Though the fear and reluctance to ask for help it would make the more complicated problem. Well, for those of us who feel ashamed to ask for help. Consider some reasons why we do not need to hesitate to ask for help to others as quoted in Psychologytoday.com below. Confessing that we need help and help is a strength. When we ask for help, it means we recognize our weaknesses and realize what needs to be fixed from us. And acknowledging weakness and struggling to improve it is a strength, not a weakness! It is just being wise enough to know you can not always do it alone and of course, you want yourself improving. Asking someone else for help provides an opportunity for the person to do good. We may be afraid to ask for help for fear that the person will be disturbed. Though mutual help that can make the relationship more closely. This means there is a bond of mutual need that makes both parties feel the need each other. And of course, a good friend will help you with no hesitate. Accepting help saves time and reduces bad mood. We may want to save our pride so we are reluctant to ask others for help. But it will only make our mood blinder. In fact, we are wasting our time trying to accomplish what we can not really accomplish. We are not fighting alone. When we find it difficult, we tend to think that we alone are struggling in the midst of it. But when we dare to ask for help, we can feel more relieved, because we are not fighting alone. Asking for help is a big thing, it’s empowering, and wonderful to feel the never ending support from people around who care about you. Asking for help can reduce our shyness in the future.